For years, business schools and professional consultants have turned to Sun Tzu's 2,500-year-old Chinese text for its invaluable commentary on such topics as leadership, strategy, organisation, competition and cooperation. Now the wisdom of Sun Tzu's The Art of War is made accessible to the modern reader. Not simply a new translation, this is the first book to provide a clear, easy-to-follow interpretation of the classic document. The Art of War for Executives reveals the brilliance of Sun Tzu - and shows how to win on the battlefield of modern business. The tone and insight of the original classic remain, whilst incorperating the ideas of contemporary business philosophers, like Peters, Drucker and Bennis. 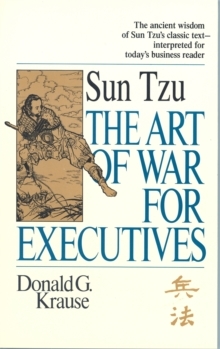 Here at last is an accessible interpretation of Sun Tzu's The Art of War incorperating modern business lessons to make this classic text relevant and readable for today's executive facing strategic and competitive challenges.